The Oculus Rift headset began shipping last week, signaling a profound transition in media consumption and a paradigm shift for marketers and consumers alike. Gone are the days of coin-operated pinball and Space Invaders, virtual reality headsets will take you inside games and through make-believe worlds like no other device before it. Virtual Reality will change the way we consume media, how we shop, how we work and how we perceive the world. A recent article in Adweek looks at the implications of VR to marketers, warning that it’s a tide you won’t be able to avoid. What are marketers doing to get ahead of the curve? Companies like Google have developed inexpensive VR headsets that allow app developers to create innovate new content experiences, from video games to music videos. Samsung has their Gear VR, which is basically a more robust version of what’d you’d experience with Google Cardboard. Both platforms allow app developers to partner with brands in order to deliver immersive, VR marketing content. 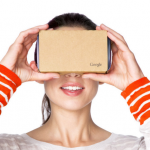 While Google Cardboard is about a year old now, a few companies embraced it early on. One example is The North Face, who collaborated with Jaunt to create an app for Google Cardboard that transports viewers to Yosemite National Park and Moab, Utah to explore and experience the terrain beside North Face athletes. The North Face theory is that if you spark an interest among consumers to get outdoors, they’ll eventually buy North Face products. 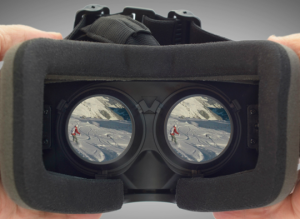 The North Face used an immersive, innovative VR app to do just that, debuting the app to SXSW ’15 attendees. Other companies to adopt early VR campaigns were Marriott Hotels with their Virtual Transporter and Patron Tequila with a 3D video captured by drone camera detailing the rich story behind the way their tequila is made. Volvo was the first automaker to develop a VR campaign and the list of marketers clamoring to get in to this space only continues to grow. Facebook, owner of Oculus VR, is betting big that the new platform will be the next game changer. It’s no secret that Facebook is focusing on entertainment and gaming, following their tried-and-true plan of building an audience, turning that audience into a commodity, and then forcing brands to pay to interact with that commodity. While it may come later, VR will be a boon for more than just gaming and entertainment. Industries like retail, education, training and travel will all benefit from “try before you buy” offers for consumers. Indeed, Facebook has already developed a 360-degree Video Ad for the likes of Nestle, AT&T, Samsung and Mountain Dew. The ads can be viewed on laptop or mobile devices but provide an optimal viewing experience on iOS or Samsung VR devices. Consumers seem to be ready for VR but only at the right price, Samsung’s $99 Gear VR Powered by Oculus sold out on Amazon in two days while early sales of the $600 Rift have not met expectations. The virtual and augmented reality market could become an $80 billion industry by 2025, with reaches far beyond gaming and entertainment, according to Goldman Sachs. Goldman predicted that the industry could pull in $45 billion in hardware revenue and $35 billion in software by then. In the short term however, while Gartner Group projects 25 million virtual or more limited augmented-reality combined headsets will be in consumer’s hands globally by 2018, some feel that many of the earliest adopters may be hard-core gaming enthusiasts who may be of limited interest to many brands. Does your company have plans to incorporate VR marketing into its mix? How do you see VR changing the digital marketing landscape? Tweet us your thoughts at @anvilmedia.